A right whale and her calf fed off the shores of Duxbury Beach in 2015. After a year when scientists found a record number of dead North Atlantic right whales, the species has yet to produce a single newborn this calving season — an unprecedented and potentially catastrophic outcome for one of the world’s most endangered animals. There are only about 100 adult female right whales left in the world. If any had given birth this season, which typically runs November through February, scientists say they almost surely would have spotted new calves by now. Over the past year, 18 right whales have been found dead, winnowing the population to about 430. At that rate, the species could go extinct by 2040, scientists say. It remains possible that the whales could still produce calves this year, but Zoodsma and other scientists aren’t optimistic. Just five calves were born last season, among the lowest totals recorded. Over the past decade, there have been an average of 18 calves born each year. While the number of adult females has actually increased in recent years, the number producing calves has fallen significantly. Adult females are giving birth less frequently. On average, they used to produce calves once every three years; now it’s more like once every decade. The best explanation for the decline is that nearly all right whales have been injured by fishing lines, scientists say. In a federal survey of right whale deaths between 2010 and 2014, scientists found that 82 percent died as a result of entanglements in fishing gear; the rest died as a result of ship strikes. The stress of swimming while entangled in fishing gear, which can gouge whales’ blubber, makes it harder for many females to become pregnant. Climate change could also be a factor. The Gulf of Maine has warmed faster than nearly any body of water on the planet, a shift that has affectedorganisms throughout the ecosystem. In the past decade, scientists have measured an 80 percent fall in phytoplankton, which sit at the bottom of the marine food web and provide the building blocks of life for nearly all organisms in the ocean. Among those organisms are copepods, tiny crustaceans that right whales have long fed on in the nutrient-rich waters off New England. Scientists have theorized that copepods have been moving north to the colder Canadian waters, which could also explain why more right whales have been turning up there in recent years. Last year, in a surprise to scientists, an unprecedented 12 right whales were found dead in the Gulf of St. Lawrence. 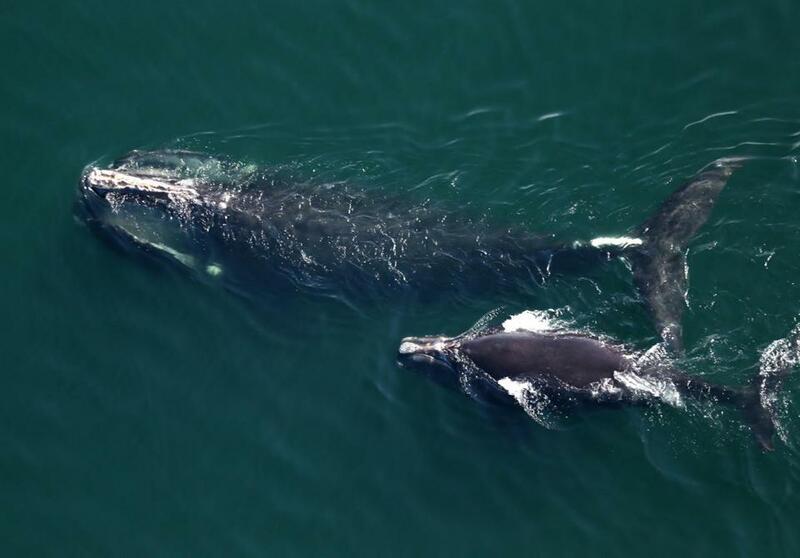 The changing temperatures and distribution of right whales could also be changing their birth cycles, giving scientists hope that some of the adult females could still produce calves in the coming months. Scientists said they had recently spotted eight right whales swimming off Georgia and northern Florida, where they traditionally spawn. Environmental groups that have raised alarms about the dangers to right whales say the lack of births so far this season reinforces their arguments that authorities must more aggressively protect the species. They’ve filed lawsuits against NOAA urging the agency to do more and have called on officials to take a range of actions, from requiring that lobstermen use different gear to closing off more areas to fishing. 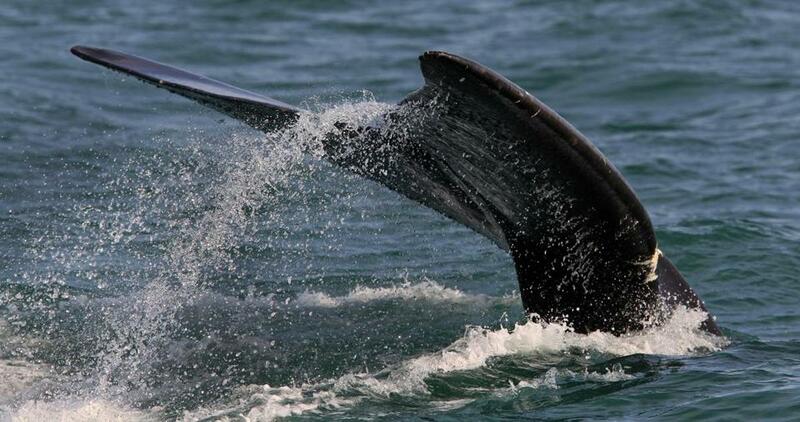 The fluke of a right whale showed past signs of entanglement off the coast of Provincetown.